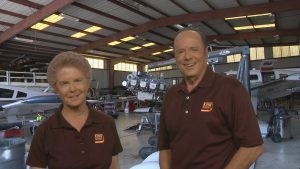 New Aviation Mechanics Courses Help Careers Takeoff! Screen capture from the new King Schools new, online A&P Mechanics Course series. July 26, 2018 AirVenture – Oshkosh, WI. Aspiring aviation mechanics have a new way to prepare for their FAA Oral, Practical, & Written Tests. King Schools has released online versions of their popular General, Airframe, and Powerplant Knowledge & Test Prep Video Courses. The online A&P Mechanics courses include updated video lessons and an integrated Test Prep section featuring an extensive database of FAA-style questions, online flashcards and timed practice exams. The new courses are also compatible with the KING Companion App for iPad or iPhone. The App allows you to download your lessons (videos and quizzes), and take them when offline. When back online, your course progress is automatically synchronized with King’s servers and available from any other device. They sell for $199 each and include lifetime updates. The Online A&P Mechanics Bundle includes all three courses for $495 and includes the new King Schools Online Aviation Library ($79 value). I’m really pleased that even more opportunities are being made available for people to get involved with aviation. It’s such an exciting industry to be a part of, especially with all the new innovative technology being rolled out.